Since Fernandes guitars were originally a flamenco guitar company, they are familiar with creating guitars with superior acoustic tones — percussive acoustic quality that belies in their solidbody construction. The Monterey Elite solidbody electric is no exception. 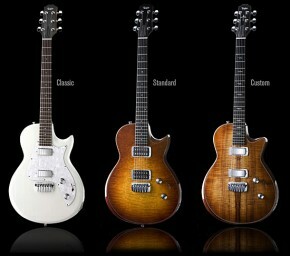 The Monterey Elite emulates a curvy Gibson-style Les Paul singlecut design. The guitars wide hips, narrow waist and a rounded upper bout gives the Monterey Elite its own elegance. To create the guitar’s tone, Fernandes crafted the body of the guitar with a slice of mahogany wood that supports a relatively thick slab of carved and figured maple top. The rounded C-shape neck has a medium-thin carve feel that should be comfortable for virtually any guitarist; feels good over long playing sessions and tapers toward the upper frets without becoming too cumbersome. Playability is extremely smooth on the Monterey Elite with a short 24 ¾-inch scale and 22 jumbo frets. A Gotoh Tune-O-Matic bridge and stop-tail piece work well with the guitar’s Graphtech trem nut, giving the Monterey Elite a sharp attack and clean sustain. Considering how nice the response and feel is of this guitar, a standard set of Duncan pickups would be the final topping on the cake, but Fernandes chose to push the Elite’s performance over the top with Duncan JB in the bridge and Sustainer humbucker in the neck. If you don’t already know, the Sustainer Fernandes neck humbucker doubles as a pickup and a magnetic driver. In conjunction with an active onboard electronics package, it’s capable of producing everlasting sustain of notes or chords. Two mini switches (above the knob controls) and a single knob lets you turn the system on and off, switch between standard or harmonic feedback Sustainer modes and adjust the Sustainer’s intensity. With Monterey’s combination of thin mahogany body and thick carved maple top creates depth and exceptional acoustic clarity. Duncan JB humbucker perfectly enhances the wood tones, providing deep midrange kick, punchy lows and articulated highs. The first amp I plug the Monterey into was a Marshall. The guitar, amp and JB humbucker’s midrange curve all combined for a focused sound that achieve and abundance of sustain at high- and low-gain settings. Solos really sang from the neck’s Sustainer humbucker, even with the Sustainer system deactivated, she still gently weeps with perversion (like the Beatles’ song). The neck pickup’s primary function is to act as the Sustainer’s magnetic exciter. The exciter, clear and uncolored presentation, personalized my sound and nothing else. The glassy clean tones, when plugged into a Fender Deluxe, extended to a rock guitar sound far beyond the typical electric guitar tonal capabilities. The Duncan JB and Fernandes Sustainer pickups were both able to deliver the amp’s articulate and warm tones, especially when guitars overdrive kicked in. Pairing the Sustainer pickup along with the Monterey Elite gives you a guitar experience that is like no other. Playing your favorite note and feeling the Sustainer stimulate the string vibration under your finger tips, will make you become a whole new and improved player; the boundaries of natural sustain are no longer going to get in your way of creativity. The Fernandes Monterey Elite isn’t your typical electric guitar; it provides modern classic sounds that resonates with loud and aggressive personality. The guitar boasts a Seymour Duncan JB humbucker as stock equipment and features Fernandes’ renown Sustainer system in the neck, providing even more musical expression and creativity. This guitar is a rockers dream. Check for price.